Hahahahahahahahaha… God knows I couldn’t make it out of Australia without a good story. OK, so we made it to the rain forest, and we were only staying there for one night. After a day of exploring, we were pleasantly surprised to find that our lodge was really nice compared to the previous two. Let me just say that one of the others had concrete floors with an outhouse. The other didn’t have glass windows, just a screen with blinds and its only piece of furniture other than beds was a rusted fridge that didn’t work. THIS PLACE was really nice though. A fully stocked kitchen, a lovely little heater that looked like a fireplace, flat screen TV, wifi, king sized beds… I mean, super nice. Especially considering the others. My brother Ryan and I even had our own lodge next door to the rest of our family. After investigating the place, we decided that Ryan would get the king sized bed in the bedroom, and I would take the twin in the living area by the heater. We were both showered and ready for bed, so I kicked him away from the TV so I could get some sleep. Before he left he asked if I had checked my bed for bugs, so I threw back the covers and gave the all clear. Since we began the trip we had been checking our beds for bugs and hadn’t found any, even in the seedier places. 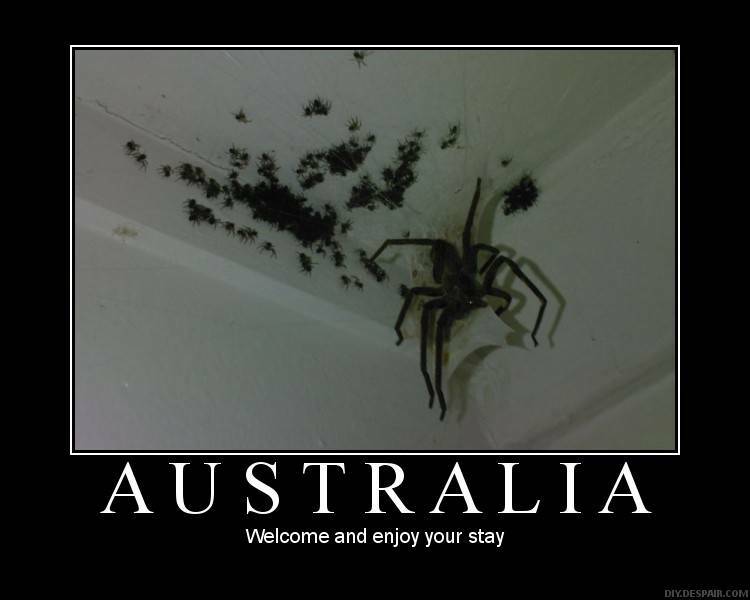 The internet really leads you to believe that you will be battling giant spiders and centipedes to the death for bed space in Australia. Ryan walked out and closed his bedroom door as I turned out the lights. It was pitch black, so I turned the brightness up on my kindle and used it as a flashlight to get to my bed. I jumped into bed, ready to get a fabulous night’s sleep, and threw the blankets back over me. Before I turned over to sleep, I made (what I consider to be) a life saving decision. 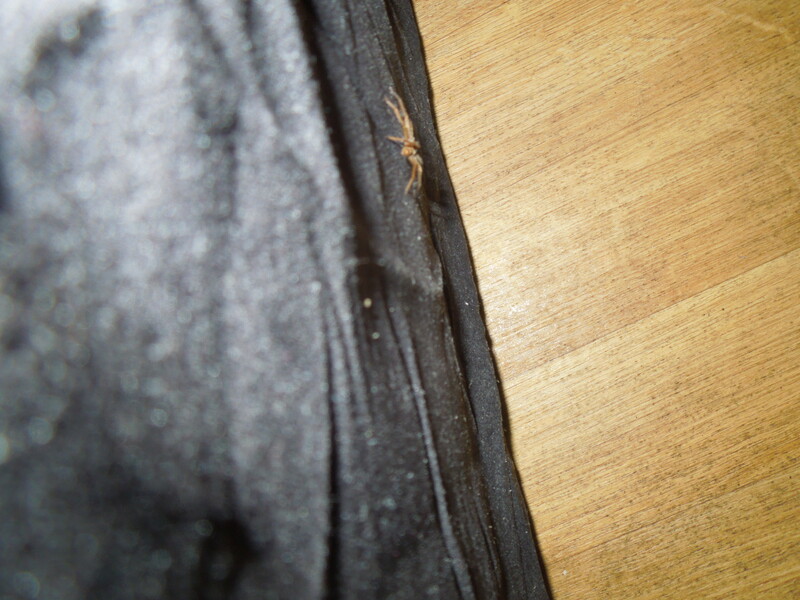 I decided that I would check beside and behind the bed for any bugs since it was in the corner. I turned my kindle over to shine it down the side of the bed and saw the BIGGEST SPIDER I HAD EVER SEEN IN MY LIFE SPRINTING UP THE SIDE OF THE BED RIGHT AT MY FACE. I replied, “Ok, just let me get a picture for my blog first.” <—— Not a joke, I actually said that. And sure enough, that spider was so fast that it was able to dodge the shoe every time! On my final swing it got smart and ran into the sheets… And that is when we noped the nope out of there. Well, actually, it was a little more complicated than that. We looked under and around the bed, but couldn’t find the big spider, and there was no way I was digging through the pile of sheets to find the small one. We then decided that we would share the king bed in the bedroom. Well, we checked and THERE WAS A FREAKING SPIDER THERE DO YOU HEAR ME THERE WAS A SPIDER THERE TOO! 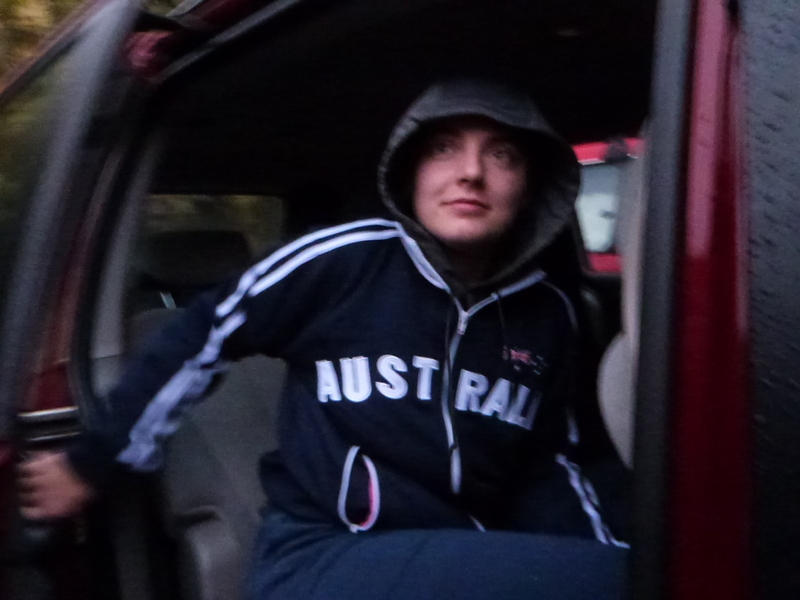 We then decided that our only option was to sleep in the van we rented. 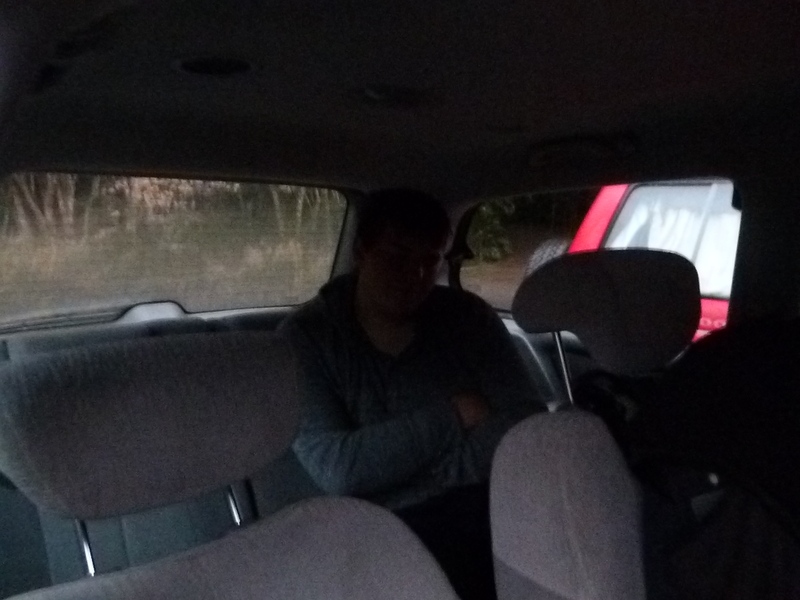 But we realized a problem… The van keys were with our family next door, who were all asleep. Now, if you happen to live in a family with a small child, you know that if said child is asleep and you wake her up, you will die. I told Ryan to pack his things while I tried to wake someone up next door. I thought that my sister was sleeping on the bed in the living area (like my bed), so to wake up my mom or stepdad, I took a flashlight and shined it into their room while flashing my hand in front of it. This did not work. I went back to our lodge to check on Ryan and I saw ANOTHER SPIDER crawling out from under the fridge. I stomped the crap out of that spider and kept on moving. Since our bathroom was on the other side of my parents’ bedroom, I had Ryan bang on the wall while I went back outside and did some flashlight flashing. Eventually it worked and my stepdad came and opened the door. I ran back to our lodge, victorious, and we grabbed all of our stuff and ran out to the van. It was a pretty horrible night’s sleep because I was freezing and Ryan was cramped, but it was better than being anywhere near those monster spiders. We were woken up by my stepdad, who took the following lovely pictures, because we needed to get ready for our second tour and trek to find a platypus. I had two jackets on and used a third to cover my legs but I was still cold. It’s not like I could get a spider infested blanket from inside. So cramped and so sleepy. Ryan and I went back to our lodge to go over it and be sure we hadn’t left anything. We grabbed a few odds and ends and on our way out, I noticed something odd. The spider I smashed was gone. The spider that I had smashed when I came in the night before was gone becAUSE SOMETHING ATE IT. The smudge was still on the floor, but the spider was completely gone. And no, it didn’t live through the squashing. I am 100% sure of this. SOMETHING ATE THE SPIDER DURING THE NIGHT. Luckily, that is where the horror ends. We made it out of the lodges without further incident.